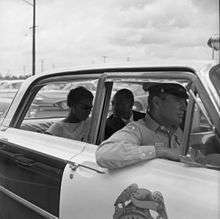 The first Freedom Ride began on May 4, 1961. Led by CORE Director James Farmer, 13 riders (seven black, six white, including Genevieve Hughes, William E. Harbour, and Ed Blankenheim) left Washington, DC, on Greyhound and Trailways buses. Their plan was to ride through Virginia, the Carolinas, Georgia, Alabama, and Mississippi, ending in New Orleans, Louisiana, where a civil rights rally was planned. Most of the Riders were from CORE, and two were from SNCC. Many were in their 40s and 50s. Some were as young as 18. ↑ Included 16 participants - Louis Adams, Dennis Banks, Ernest Bromley, Joseph Felmet, George Houser, Homer A. Jack, Andrew S. Johnson, Conrad Lynn, Wallace Nelson, James Peck, Worth Randle, Igal Roodenko, Bayard Rustin, Eugene Stanley, William Worthy and Nathan Wright. 1 2 Included 18 participants - Frances Bergman, Walter Bergman, Albert Bigelow, Edward Blankenheim, Benjamin Elton Cox, James Farmer, Robert G. (Gus) Griffin, Herman K. Harris, Genevieve Hughes, John Lewis, Jimmy McDonald, Ivor (Jerry) Moore, Mae Frances Moultrie, James Peck, Joseph Perkins, Charles Person, Isaac (Ike) Reynolds and Hank Thomas. ↑ Included 22 participants - William Barbee, Paul Brooks, Catherine Burks-Brooks, Carl Bush, Charles Butler, Joseph Carter, Allen Cason Jr., Lucretia Collins, Rudolph Graham, William E. Harbour, Susan Hermann, Patricia Jenkins, Bernard Lafayette, Frederick Leonard, John Lewis, Salynn McCollum, William B. Mitchell Jr., Etta Simpson, Ruby Doris Smith-Robinson, Susan Wilbur, Clarence M. Wright and James Zwerg. ↑ Included 7 participants - Clyde Carter, William Sloane Coffin, Joseph Charles Jones, John Maguire, Gaylord Noyce, George B. Smith and David E. Smith. ↑ Included 12 participants - Julia Aaron, Alexander M. Anderson, Harold Andrews, James Bevel, Joseph Carter, Dave Dennis, Paul David Dietrich, Bernard Lafayette, James Lawson, Jean Catherine Thompson, C. T. Vivian, Matthew Walker Jr.
↑ Included 15 participants - Peter M. Ackerberg, Doris Jean Castle, Lucretia R. Collins, John Lee Copeland, Dion Tyrone Diamond, Grady H. Donald, James Farmer, Frank George Holloway, John Lewis, John H. Moody Jr., Ernest (Rip) Patton Jr., Jerome H. Smith, Clarence Lloyd Thomas, Hank Thomas and LeRoy Glenn Wright. ↑ Included 9 participants - Catherine Burks-Brooks, William E. Harbour, Frederick Leonard, Lester G. McKinnie, William B. Mitchell Jr., Etta Simpson, Mary J. Smith, Fances L. Wilson and Clarence M. Wright. ↑ Included 8 participants - Allen Cason Jr., Albert Lee Dunn, David B. Fankhauser, Franklin W. Hunt, Larry Fred Hunter, Pauline Edythe Knight, William Carl Mahoney and Charles David Myers. ↑ Included 8 participants - James Keet Davis Jr., Glenda Jean Gaither, Paul S. Green, Joe Henry Griffith, Charles Haynie, Robert Lawrence Heller, Sandra Marie Nixon and Peter Sterling. ↑ Included 6 participants - Charles Butler, Price Chatham, Joseph John Michael McDonald, Meryle Joy Reagon, Kenneth Martin Shilman and Ruby Doris Smith-Robinson. ↑ Included 8 participants - Ralph Fertig, Richard LeRoy Gleason, Jesse J. Harris, Cordell Reagon, Carolyn Yvonne Reed, Felix Jacques Singer, Leslie Word and Elizabeth Porter Wyckoff. ↑ Included 7 participants - Johnny Frank Ashford, Abraham Bassfordt, James Thomas McDonough, Terry John Sullivan, Shirley Thompson, James Robert Wahlstrom and Ernest Newell Weber. ↑ Included 6 participants - John Gager, Reginald Malcolm Green, Edward W. Kale, Raymond B. Randolph Jr., Carol Ruth Silver and Obadiah Lee Simms. ↑ Included 1 participant - Michael Audain. ↑ Included 3 participants - Gwendolyn C. Jenkins, Robert L. Jenkins and Ralph Edward Washington. ↑ Included 9 participants - Travis O. Britt, Stokely Carmichael, Gwendolyn T. Greene, Teri Susan Perlman, Jane Ellen Rosett, Jan Leighton Triggs, Joan Harris Trumpauer, Robert Wesby and Helene Dorothy Wilson. ↑ Included 2 participants - Mark Lane and Percy Sutton. ↑ Arsenault (2006), pp. 533–587. ↑ Upchurch, Thomas Adams (2008). Race Relations in the United States, 1960-1980. Westport, Connecticut: Greenwood Press. p. 14. ISBN 9780313341717. ↑ 328 U.S. 373 (1946); also "Morgan v. Virginia". Law.cornell.edu. Retrieved December 12, 2011. ↑ "The Freedom Rides". Congress of Racial Equality. Retrieved March 20, 2011. ↑ "Journey of Reconciliation". Spartacus Educational. Retrieved April 29, 2008. 1 2 3 4 ""Freedom Riders," WGBH American Experience". PBS. Retrieved December 12, 2011. 1 2 3 4 5 "Get On the Bus: The Freedom Riders of 1961". NPR. Retrieved July 30, 2008. ↑ . "With the police holding back the jeering crowd, and with the deacons openly displaying their weapons, the weary but relieved Riders piled into the cars, which promptly drove off into the gathering dusk. 'We walked right between those Ku Klux,' Buck Johnson later recalled. 'Some of them had clubs. There were some deputies too. You couldn't tell the deputies from the Ku Klux.' "Get On the Bus: The Freedom Riders of 1961". NPR. Retrieved July 30, 2008. 1 2 3 4 5 6 7 8 9 Freedom Rides ~ Civil Rights Movement Veterans. ↑ Photo of James Peck after being attacked in Birmingham, Alabama, University of California. Retrieved February 1, 2010. ↑ Arsenault (2006), p. 160. ↑ Branch, Taylor (1989). Parting the Waters: America in the King Years, 1954–63. Simon and Schuster. p. 423. ISBN 978-0-671-68742-7. ↑ Fankhauser, David. "SNCC GETS INVOLVED IN THE FREEDOM RIDES". Freedom Rides. David Fankhauser. Retrieved 21 October 2013. ↑ Joan Biskupic (April 15, 2002). Ex-Supreme Court Justice Byron White dies. USA Today. Retrieved October 20, 2008. ↑ "Assistant Attorney General Thomas E. Perez Speaks at the All People's Program Honoring the Freedom Riders". US Department of Justice. Retrieved December 12, 2011. ↑ "Freedom Riders Head for Mississippi". The Miami News. Associated Press. May 24, 1961. Retrieved November 27, 2010. 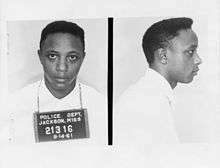 ↑ "Mississippi Arrests 12 Freedom Riders". The Miami News. Associated Press. May 24, 1961. Retrieved November 27, 2010. ↑ "Obituary of Gaylord Brewster Noyce". 2009. Retrieved October 28, 2009. ↑ "Freedom Riders". American Experience, PBS. 2011. ↑ McMillen, Neil R. (August 1977). "Black Enfranchisement in Mississippi: Federal Enforcement and Black Protest in the 1960s". The Journal of Southern History. 43 (3): 351–72. JSTOR 2207646. ↑ Morgenroth, Florence (July 1966). Organization and activities of the American Civil Liberties Union in Miami, 1955–1966 (thesis). Coral Gables, FL: University of Miami. pp. 102–3. OCLC 15796239. ↑ "Dresner v. City of Tallahassee, 375 U.S. 136, 11L ed 2d 208, 84 S.CT. 235 (1963).". 1963. Retrieved May 1, 2011. ↑ Arsenault (2006), pp. 403-417. ↑ Arsenault (2006), p. 438. ↑ Arsenault (2006), pp. 42, 533-534. ↑ Thurber, Jon (March 4, 2005). "Nathan Wright Jr., 81; Minister Was Figure in 1960s Black Power Debate". Los Angeles Times. Retrieved 30 November 2016. ↑ Arsenault (2006), p. 319. ↑ Martin, Douglas (October 10, 1999). "Walter Bergman, Champion Of Civil Liberties, Dies at 100". New York Times. Retrieved 30 November 2016. ↑ Wood, Paul (June 16, 2011). "Life Remembered: Ben Cox, One of Freedom Riders". News-Gazette. Retrieved 30 November 2016. 1 2 Arsenault (2006), pp. 113, 535-536. ↑ Arsenault (2006), pp. 537-538. ↑ Arsenault (2006), p. 542. ↑ Arsenault (2006), pp. 539-540. ↑ Tamburin, Adam. "Civil Rights Activist Matthew Walker Jr. Dead at 74". Tennessean. Retrieved 30 November 2016. ↑ Arsenault (2006), pp. 540-541. ↑ Arsenault (2006), pp. 543-544. ↑ Arsenault (2006), p. 544. ↑ Arsenault (2006), p. 545. ↑ Arsenault (2006), p. 546. ↑ Arsenault (2006), pp. 546-547. ↑ Mitchell, Jerry (January 29, 2015). "Longtime Civil Rights Activist Jessie Harris Dies". Clarion-Ledger. Retrieved 1 December 2016. ↑ Arsenault (2006), pp. 547-548. ↑ Arsenault (2006), pp. 548-549. 1 2 3 Arsenault (2006), p. 549. ↑ Arsenault (2006), p. 550. ↑ Barnum, Art; Biddle, Fred Marc (July 23, 1988). "Activist Pastor Slain, Suspect Held". Chicago Tribune. Retrieved 1 December 2016. ↑ Arsenault (2006), p. 557. ↑ "A Tribute to Freedom Riders". The Oprah Winfrey Show. Retrieved March 3, 2013. ↑ Okarmus, Matt (March 3, 2013). 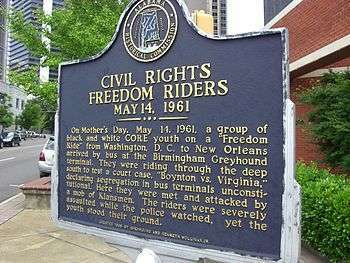 "MPD Apologizes to Freedom Riders". Montgomery Advertiser. pp. 1–2. Retrieved March 3, 2013. ↑ Greenberg, Joel (November 15, 2011). "Palestinian Freedom Riders Arrested on Bus to Jerusalem". Washington Post. ↑ Collard, Rebecca (November 15, 2011). "Palestinian freedom riders board Israeli buses in protest". Christian Science Monitor. ↑ "Palestinian 'freedom riders' board settlers' bus". BBC News. November 15, 2011. ↑ Waddington, Chris (October 15, 2011). "Xavier prof pens opera set in New Orleans during Civil Rights struggles". New Orleans Times-Picayune. Retrieved 23 October 2011. Etheridge, Eric; Wilkins, Roger; McWhorter, Diane (2008). Breach of Peace: Portraits of the 1961 Mississippi Freedom Riders. Atlas & Company. ISBN 9780977743391. Spears, Ellen (June 29, 2009). "Memorializing the Freedom Riders". Southern Spaces.